Newly identified remains from Vindija in Croatia, which date to between 42,000 and 28,000 years ago, are more delicate than "classic" Neanderthals. 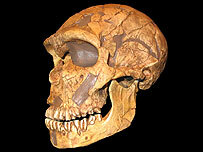 Details of the research appear in the Journal of Human Evolution. Excavations also reveal the Vindija Neanderthals were developing advanced ways of making stone tools that mirror innovations elsewhere by modern humans (Homo sapiens). Researchers have pieced together a partial Neanderthal (Homo neanderthalensis) skull from fragments found mixed in with animal bones from the site. The skull comes from ground layers dating to between 42,000 and 38,000 years ago. The researchers also found other fragments of Neanderthal bone from later ground layers in the cave. Analysis of this cranium appears to confirm suggestions from earlier finds at Vindija that the Neanderthals there were evolving a more "gracile" anatomy - less sturdy than classic big-boned Neanderthals. The skull's supraorbital torus - an arching, bony ridge above the eyes - is not as thick and projecting as in other Neanderthal remains. 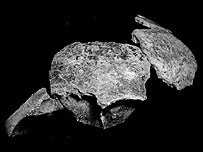 The specimen also has a higher braincase than is typical in Neanderthals. "You know, the Vindija material is interesting because it is more gracile than classic Neanderthals. "It suggests some contact between Neanderthals and modern humans but we don't know yet whether there was some interbreeding." 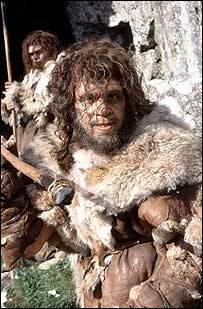 The suggestion that Neanderthals interbred with modern humans is highly controversial. Many researchers believe they did not contribute genes to present-day populations. Most researchers now believe that our own species evolved in Africa and then swept across Europe, replacing the Neanderthals - the so-called "Out of Africa" model. Comparisons of mitochondrial DNA from Neanderthals and modern humans have failed to reveal any signs of mixing between the two populations. But Dr James Ahern of the University of Wyoming, US, lead scientist in the latest study, thinks the replacement of Neanderthals by modern humans was not a simple process. "There was a far more complex dynamic going on between 20,000 and 29,000 years ago than some people think. "I'm sure that there were some things post-Neanderthal populations assimilated from their predecessors, certainly in the biological sense," Dr Ahern told BBC News Online. Remains of early modern humans from Central Europe often display Neanderthal traits, say the researchers. But these features are no longer as common in present-day European populations. Neanderthals began to evolve in Europe around 230,000 years ago and dominated the continent until around 35,000 years ago when people with a more modern anatomy entered the continent. They were proficient hunters and well-adapted to an Ice Age climate. But their distinctive anatomy has led researchers to classify them as a separate species from us. The Vindija cranium predates the first recorded presence of modern humans in Europe by around 5,000 years. Dr Ahern thinks this suggests that Neanderthals and modern humans in Africa were evolving in the same direction in response to common environmental pressures. "They were evolving in the same way because they were part of a larger human species. Neanderthals just didn't change as rapidly as some of the other people," he explained. These pressures may have been rooted in sharp changes in the global climate. The evolution of a modern, or slight, physique by humans in Africa is thought to coincide with an emphasis on cultural and technological ways of dealing with everyday tasks that earlier people - including the Neanderthals - solved with brute force. Innovations believed to coincide with the appearance of modern human anatomy include hunting with bows and arrows and the use of harpoons for fishing. Dr Ivor Karavanic of the University of Zagreb found that around 38,000 years ago, Neanderthals began making more use of the mineral chert for stone tools. Chert is a superior material to the quartz that Neanderthals at the site had previously used. This behaviour mirrors cultural changes taking place at the same time in modern human populations and may indicate more advanced thinking. Were the Neanderthals Our Ancestors?